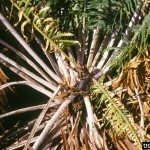 I have three potted sago palms all about 6-10 years old. This year they were hit hard with a Texas Hill Country freeze. One of the sagos has produced leaves from the mother plant. The other two only seem to be producing leaves from under the dirt, which I assume are from pups. How do the remove pups, and what happens to the mother plant. Will it eventually produce its own leaves again?